Manufactured homes are the fastest-growing type of housing in the U.S. for two reasons: affordability and value. This type of housing is the answer for thousands of Ohio residents who haven’t been able to qualify for their own homes at today’s prices. With site-built housing costs averaging $164,217 (without land), many residents are priced out of the market, especially if they are young, or have single or fixed incomes. With household composition changing, the future market growth potential for manufactured housing appears to be singles, unrelated couples, married couples with one or more children, and single parents with one or more children—all of these groups are generally found to have low-to-moderate incomes and are renting their current dwellings. Already, this change in household makeup has impacted the industry. Senior adults continue to find manufactured homes an attractive alternative to site-built homes. Even though this group is more likely than younger groups to own their homes free and clear, they often live in older homes and find the cost and labor of upkeep and repair to be more than they can afford. 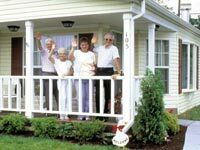 For more information about manufactured homes, visit our web site at www.welcomehomeohio.com or contact the Ohio Manufactured Homes Association, 201 Bradenton Avenue, Suite 100, Dublin, Ohio, 43017-3540; (614) 799-2340.